Welcome to the UT Trumpet Studio, a group of approximately 25-30 undergraduate and graduate music majors like yourself. Each week you’ll take a one-hour private lesson and a 90-minute studio class (Solo Class). 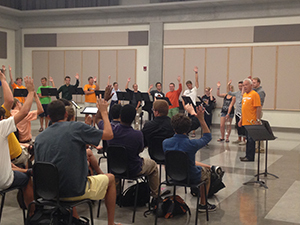 Most students elect to play in the UT Trumpet Ensemble, which meets once a week for 90 minutes. Major ensembles open to all trumpet studio members by audition include the UT Symphony Orchestra, the UT Wind Ensemble, Symphonic Band, Concert Band, the Pride of the Southland Marching Band, and the UT Jazz Band. There are also numerous small jazz ensembles, brass quintets, and trumpet ensembles of all sizes. The UT Trumpet Ensemble is an active group that has performed at ITG Conferences at the University of Maryland (1990), in Rotterdam, the Netherlands (1992), the University of Richmond (1999), and at Rowan State University (2006), Columbus State (Columbus, GA) in 2012, and Columbus, Oh in 2015. We perform regularly at UT ceremonies and specialize in bringing music for trumpet ensembles large and small to the greater East Tennessee region. The combined effect of challenging, supportive private instruction, a variety of top-notch ensemble experiences, rigorous academic courses in music theory and musicology, will encourage you to develop your trumpet playing and musicianship. Students are expected to practice on average, a minimum of 2 hours daily (Music Education and BA: Applied majors, and 3 hours (Performance majors). If you are interested in learning how to be the best musician and trumpet player you can be, become a member of the UT Trumpet Studio. Please contact Dr. Cathy Leach at cleach@utk.edu and see the Auditions section of this website. I look forward to meeting you and hearing you play!